The Dallas Winds recently recorded our sixteenth album with Reference Recordings. It is a cross section of John Williams’ music from the movies, and we were told the arrangements were authorized by John Williams’ office which is very involved in this long-term recording project. Reference Recordings said this album will be released in the spring of 2017. In this music every aspect of playing was challenged. “The Imperial March” and “The March from Superman” are from two of Williams’ oldest scores from the 1970’s, written for an orchestra with a full section of string basses. Basses have no problem playing those low articulated pedal point parts for page after page but on tuba it can become an athletic assignment. The 844 responds so well in the low register that three pages of that repeated pattern isn’t the workout I expected. Trying to be heard over timpani is never fun but all I had to do was fill up with air and go. The color of the BMB tuba was up to the task. The “Suite from JFK” (I’m not sure of the title will be, the suite was just completed) was a challenge for a different reason. While there were a lot of parts that were obviously string bass sustaining parts, the section of the suite representing the three fatal gunshots required an almost visceral performance. The notes had to be short but there also had to be substance in the sound. This tuba had it! “Jedi Steps and Finale” from The Force Awakens had a menacing melodic motive. Scored just below the staff, I relied on the efficiency of the horn and the color of the 844’s sound to stand out from the low woodwinds without having to overbalance them. On the other side of the spectrum, the music from the movie Lincoln, “With Malice Toward None,” was a huge challenge. Chris Martin of the Chicago Symphony & the New York Philharmonic played the solo for the movie and he was brought in to play it with us on the recording. The tuba part required the very softest attacks in the low register, extremely exposed. There were also two sections that seemed to be tuba and solo trumpet duets. Playing in the same group with Chris Martin is intimidating, playing alone with him requires an instrument with consistent response and intonation so you can think about the music and not the tuba. I was happy to have BMB’s J-844 in my hands for that situation. The technical challenges showed up in spades during the “Scherzo for X-Wings” from The Force Awakens. Thank the arranger for having the great idea to score tubas with the woodwind section on a musical line that moves like leaves in the wind. Just when you start to settle in, the line skips an octave… and then jumps back down. With a lesser tuba I would have been seriously challenged. Rapid articulation in the low register was tested to the max by Williams in “The Cowboys.” Maestro Junkin likes fast tempos and he likes them a little faster than most people. That 16th note theme becomes an obstacle if your tuba has any response problems. No worries with J-844. 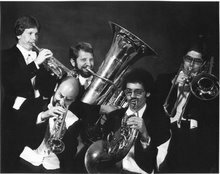 I’ve had people ask me if a 4 valve tuba is really a professional instrument. I can answer with a resounding yes! I did have to pull slides for one sustained low Db but in a brutal series of recording sessions, I only had to pull slides for low notes for that one note. No challenge in this music was a problem for an instrument like the 844. Yes, I had to practice but I never had to fight the horn and that’s what we all look for. Don’t let the price fool you, this is one serious tuba. editor's note: The 845 plays like the 844 because the fifth valve is not in the open horn.